Muntham School was situated approximately 11 miles N of Merino on the Lower Sandford Rd. N of the Wannon River. The original school built on Quinberry Hill, served the families of the selectors on the rich land between the historic HENTY Estates of "Merino Downs" and "Muntham". In about 1903, just after "Muntham" Estates were divided and sold privately, the building was moved some 2½ miles nearer the river to a site which had formed part of a stud Jersey farm called Clover Flat. Muntham School closed in 1953. 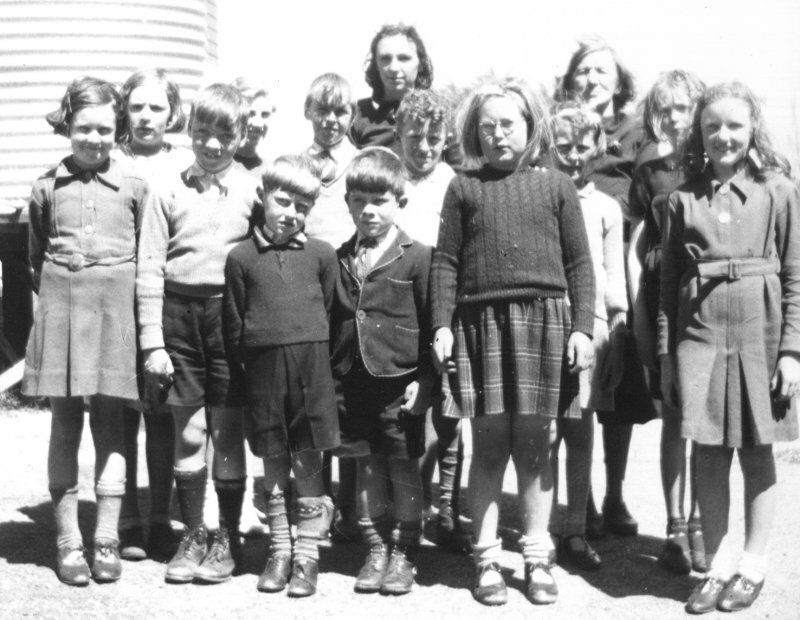 Eleven of its pupils had begun attending Merino Consolidated School, and others N of the river were provided with a bus service to Coleraine. The building was moved to Morgiana, where it gave several more years service as a school. Then in 1964 Morgiana obtained a new school and the old building was purchased by local citizens and moved to serve as a social centre. The Muntham site was purchased by the local people and there is now a recreation hall and grounds where so many farm children spent their school days. There are a few other children – about three – who are between the ages of three and ten. There is neither lock nor key to the inner door of the residence, and no lock or key to the press in the master’s desk. With these exceptions the other locks and keys are in working order. With the exception of 3 cracked panes in the school room windows, the windows are secure. 2 Tanks: the one at the residence has no tap to it. TO THE HON W SLATER, CROWN LAW OFFICES, MELBOURNE. THIS WAS TO ASK FOR HELP IN OBTAINING PERMISSION TO REMOVE THE STEPS OR GALLERY FROM THE SCHOOL FLOOR, THEREBY MAKING IT A LEVEL FLOOR FOR ENTERTAINMENTS, ETC. 8th April, believed to be 1915. 1. Pat Doyle ?, 2. Marjorie Heenan ?, 3. Ken Taylor, 4. Gillian Shady, 5. Ian Taylor, 6. Iris Edwards, 7. Geoffrey Shady, 8. Barbara Shady, 9. Margaret Shady (Teacher), 10. Carmel Ryan ? 11. Neville Taylor, 12. Peter Heenan, 13. Beverley Taylor, 14. Joan Doyle ?.